The subject of this blog has been on my list of blog posts for some time but it was my recent excursion to Coleraine to talk about the fifth century Coleraine Hoard (HERE) at the invitation of the Coleraine Historical Society that encouraged me to (finally) finish it. This inspiration is not just due to the Bann Disc having been found just a couple of miles upriver from Coleraine but also that the CHS use a slightly stylised version of the decoration of the Bann Disc as their logo and that their journal is also called The Bann Disc. The Bann Disc was found in March 1939 by men dredging the east bank of the River Bann near Loughan Island, Co. Derry just above Loughan Graveyard. It is a small, slightly convex bronze disc that measures just 10.6 cm across, but given that small size, it is in good shape despite having been submerged in wet mud for up to 2,000 years, with only a few holes, some of which were intentionally made. It was also fortunate that it was dug up again and that in digging it up, it was not further damaged or completely overlooked altogether. It could easily have been missed in the sand, silt, gravel and mud of the dredging operation, its artistic decoration lost to all time. This triskelion symbol is particularly old, with the earliest example so far found in Malta (c.4400–3600BC), although perhaps the most famous is in the astronomical calendar at Newgrange, Ireland from c.3200BC. 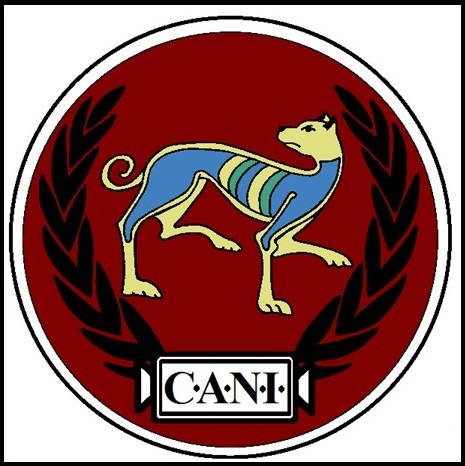 It became popular in the classical eastern Mediterranean appearing on Greek pottery and various coinage and remains so in modern times, appearing not just on modern flags such as the Isle of Mann and Sicily but also in some church decoration and on the emblems of the US Department of Transportation and the Irish Flying Corps to name a mere few. In the case of the Bann Disc, while the reverse side is “perfectly plain” (Raftery (1940), 27), the triskelion decoration provides “a measure of the technical skill of the artist and the aesthetic delight which his product affords” (Raftery (1940), 27). The circular, ornithomorphic patterns are slightly raised from the surface of the disc and were created through the painstaking process of carefully cutting down the background to leave the lines in low relief. The fine work involved in the Bann Disc is perhaps also seen in the thinness of the golden bronze used in its construction, which drops from about 0.75mm to 0.45mm in places, while the raised triskelion design is anything from 0.5mm to as low as 0.2mm high. Not only could this be evidence of the fineness of the work and the bronze (Jope and Wilson (1957), 95) but perhaps also a result of two millennia of wear. Along with wear and damage, there may have been some issues in the casting process as some bubbling seems to have aided the perforating corrosion. Unfortunately, “the complete lack of definitely dated objects, cause great difficulty in accurately assigning finds to their proper period” (Raftery (1940), 29) and the ubiquity of the triskelion provides something of an obstacle for a stylistic dating of the Bann Disc. The type of decoration present on the Bann Disc “was being produced in the casting pieces in Britain at any rate from the 1st century BC, if not earlier” (Jope and Wilson (1957), 97) and such “ornithomorphic and zoomorphic endings on spirals” (Raftery (1940), 30) remained fairly common throughout the Late Iron/’Roman’/early Christian ages (Jope and Wilson (1957), 99). However, the techniques involved in the creation of the Bann Disc seem to pin it down to a period before the wide-scale incorporation of Roman methods which will have come with the Roman advance to and then across the English Channel. This would seem to preclude the notion that the Bann Disc was made as late as the end of the third century CE (Raftery (1940), 30) and probably puts it in a period of about a century either side of the Roman conquest of Britain. This could then see the Bann Disc produced during a period of the late 1st century BCE/early 1st century CE which marked something of a ‘culmination’ of native Irish art and technique before newer skills started to filter across the Irish Sea. Of course, this is making the assumption that the Bann Disc was in fact created in Ireland… Connections between Ireland, Britain and western Europe before, during, and after Rome, have become the focus of much attention in recent years, so it would be inappropriate to overlook the possibility that the Bann Disc originated in Britain or even Gaul and was only brought to the Emerald Isle by traders or raiders (Jope and Wilson (1957), 100). So why then would a piece of such ornate skill, possibly imported for a chieftain, end up at the bottom of the Bann? The most immediate and more likely explanation is simply that it was accidentally dropped or even purposefully thrown away. However, the proximity of the Loughan graveyard does raise a potential religious element. Many Christian locations were situated on previously pagan sacred sites and Iron Age Ireland had “a long tradition of ritual deposition focused on bogs, rivers, lakes,” (Dowling in Cahill Wilson (2014), 166) so it could be asked if the Bann Disc could represent some kind of offering to the river as a deity itself or whatever god was thought to inhabit it. However, as “nothing else was found at this particular spot,” (Raftery (1940), 27) it would suggest that this exact location was not a popular site of religious offerings to the river so at best this was a one off deposition. At worst, it had nothing to do with religion at all. What the Bann Disc might actually have been could also hint at a lack of reason for offering it as tribute to a god. The three holes meant to house a link – indeed, one of the holes does contain such a link – from which a series of chains would enable the disc to be suspended from above. This idea led to the suggestion that the Bann Disc was originally part of a scale or the base of a stand for a lamp (Raftery (1940), 28-29; Hodges in Jope and Wilson (1957), 98 fig.2). Such a potentially mundane original use may perhaps seem to downplay the significance of the Bann Disc, but then only wealthy individuals would afford to have ornate scales or lamp fittings. However, it could also be argued that the thinness of the disc rules out a utilitarian purpose. Indeed, perhaps then, the disc was used for something even more ornate with the three holes being used to affix it to some sort of ceremonial headdress or decorative chest plate. At its initial creation, the Bann Disc would certainly have been decorative enough to mark out its wearer as a person of significance. Under the terms of the contract for the drainage of the river in 1939, the Bann Disc passed into possession of the Ministry of Finance (Jope and Wilson (1957), 100 n.1). It was then given to what was then the Belfast Municipal Museum and Art Gallery, renamed the Ulster Museum in 1962, so you can pop along to see for yourself one of the finest examples of Irish craft from perhaps 2,000 years ago.